Is it just me or are these dice messed up? These don't look very user-friendly to me. Re: Is it just me or are these dice messed up? They look cool though. If I was still a dice gamer I would so add them to my collection. They are awesome, but the D12 and D20 tend to roll off things. yeah, the d34 that I have has that same problem. Though at least it tends to roll in a circle. Man, I want those dice! Also Crumb's d34! I have to ask, what situation requires a roll of a d34? Are you supposed to spin those dice (including Crumb's) like a top? slim: You can roll them as you would normal dice. 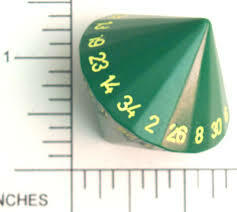 Some D34 dice are like two 17-edged tops back to back - you have to roll them as spinning them would immediately exclude the 17 'bottom' numbers. And I must ask you, what situation could not be improved with a few rolls of a d34? Each die is 'fair' in that it is symmetrical and evenly weighted - in the long run it will land on each face equally often. Now we're going to have a competition - we each choose one die and then roll them - whoever rolls the highest number will win one dollar from the other player. Then we can choose again - we're going to repeat this one hundred times before the game is over. I generously let you always make first choice, so that you can choose the die that you think stands the best chance of winning - you can change your choice each time or stick with the same die if you prefer. The amazing fact is that this is a sucker game - whichever die you choose I can choose another one that will (in the long run) win me money. A beats B 5/9 of the time. B beats C 5/9 of the time. C beats A 5/9 of the time. So in our 100-roll match, I would expect to win about 56 of the rolls and only lose 44 meaning I would expect to take about $12 from you. I was thinking about dice today. What is the chance I will roll a 1 on a single D6 if I roll it once? That seems simple enough: 1 in 6, or 16.66%. Okay, but how do the odds change as I add more rolls or more D6? What if I roll 2d6- what is the chance I will roll a 1? 2 out of the 12 possible faces result in 1. 2:12 is 1:6 is 16.66%. What if I roll 4D6, or 10D6? or 100D6? Seems like my odds of a 1 showing up out of the total rolls come close to 100% very quickly. Is there a calculation I should be making for each additional roll? Any statisticians, bookies, or math-abled bodies out there? I freely admit that my education in math extends to a pity "D" in high-school geometry along with an admonition to not return. In the case of N=2 this is equal to 1 - 25/36 = (36-25)/36 = 11/36, or what Crumb said. Out of the 36 possible results of rolling two dice, there's only one way of getting a total of two spots, and only one way of getting a total of twelve spots. The easiest number of spots to roll is seven - there are six different ways to do it. So in the long run, you will roll 7 six times as often as 2 or 12.